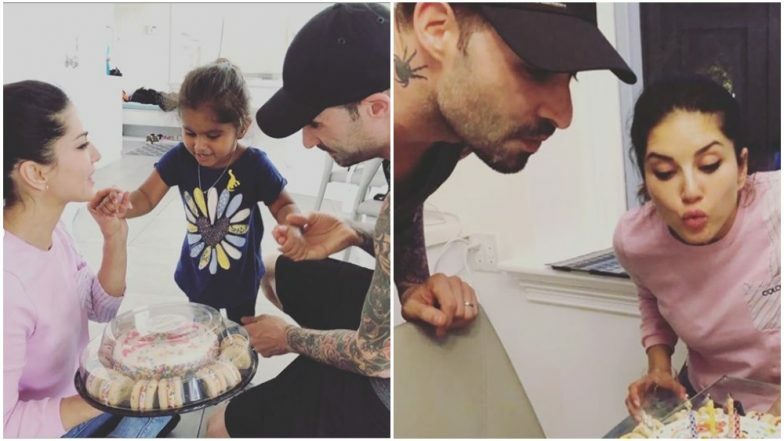 Sunny Leone and Daniel Weber celebrate their eighth wedding anniversary today and daughter Nisha had some sweet surprise planned for them. Their adorable munchkin had apparently helped them bake a cake to ring in this special occasion and Sunny had shared pictures from the same on her Insta handle. Happy Anniversary @dirrty99 you are the best part of my life, my best friend and the best father to our children! the greatest part is that our daughter made us our cake, she captioned while sharing some pictures from the celebration. Karenjit Kaur – The Untold Story of Sunny Leone Final Season: ‘Was Tough to Revisit My Dark Chapters,’ Says Sunny Leone. Sunny Leone and Daniel are great parents to three adorable kids - Nisha, Noah and Asher and their pictures together are a sight for sore eyes. While the couple had no great plans of celebrating this special day, we are glad Nisha tried to make it extra special for them. The actress is currently neck deep in her professional commitments yet tries to take out enough time for her darling children. Sunny Leone's TikTok Videos on Sadi Gali and Bolo Tara Rara Will Give You an Instant Rush of Energy. Sunny and Daniel's love story goes back a long way and the couple sure believes in setting some relationship goals. A good looking couple with a perfect family - what else do you really need? We know it's a bit too late to wish, but here's raising a toast to them.